A grieving mother sobbed as she told an inquest that her baby daughter died of heart failure after allegedly being “overlooked and neglected” by staff at Birmingham Children’s Hospital. Hayley Fullerton died at the hospital in November 2009, just weeks after her first birthday. Her mother Paula Stevenson gave evidence at her inquest on Monday and claimed Birmingham staff had failed her daughter. She later said that her own mother, Sylvia, later took her own life because she was so traumatised by the loss of her grandchild. Hayley was born in Belfast, Northern Ireland, with a heart defect and a hole in the heart in October 2008, and underwent surgery weeks later. In October 2009, she was flown to Birmingham Children’s Hospital for corrective heart surgery. The operation was a success and Hayley was transferred to the Paediatric Intensive Care Unit. But her right lung later collapsed and her health started to deteriorate, said Ms Stevenson, who now lives on Australia’s Gold Coast with husband Bobby. Ms Stevenson, 40, told Birmingham Coroner Aidan Cotter, that she was unhappy when her daughter moved wards, away from a nurse’s station. “I was extremely upset and felt that Hayley was being punished and placed as far away as possible because of my reluctance for her to be moved,” she said. Both the mum and her Northern Ireland parents, Sylvia and Edward Stevenson, later raised concerns that the little girl was having trouble breathing. But she claims their fears were dismissed and the family was assured everything was “fine”. 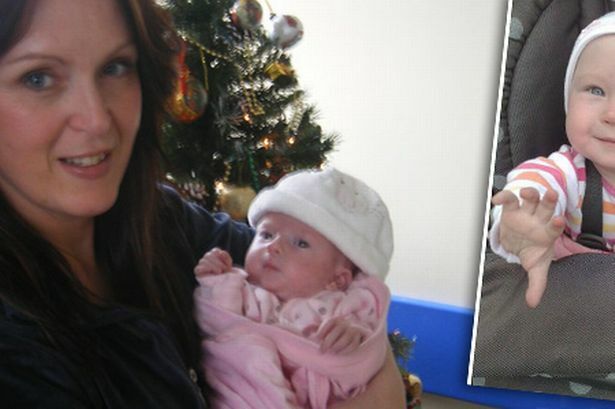 On November 11, both of Hayley’s lungs collapsed and she suffered a cardiac arrest. Ms Stevenson, who was by then in an isolation room with her daughter, raised the alarm after seeing her gasping for breath. She said: “He [the doctor] came towards me and he confirmed my worst fears and said, ‘Sorry mum, we’ve lost her’. “All I could think was that I was no longer a mummy, as Hayley was my only child, and she was dead. Ms Stevenson tearfully recalled the moment she broke the tragic news to her husband Bobby, who was in Australia. “I cuddled Hayley up in my arms and then called my husband Bobby in Australia,” she said. Ms Stevenson later claimed her mum Sylvia, 61, committed suicide in November last year because she was so distraught over her granddaughter&apos;s death. Pathologist Dr Tamas Marton said Hayley’s death was caused due to a failure of her heart to pump blood to the lungs. This failure can sometimes be caused by a collapsed lung which could have been the case with the infant, he added.